Summary: If there is one thing that most of us can agree upon univerally, it's that it is hot! Temperatures like this make us all seek out some fun, frozen treats to cool us down. Paletas, or, Mexican popsicles, are wildly popular in Mexico. If there is one thing that most of us can agree upon univerally, it’s that it is hot! Temperatures like this make us all seek out some fun, frozen treats to cool us down. Paletas, or, Mexican popsicles, are wildly popular in Mexico. They are made from fresh fruits, with water and sugar, and are void of things like artificial dyes and high fructose corn syrup. If you are looking to skip the sugar, you can add a little stevia or agave syrup. We are loving this cookbook from Fany Gerson, Paletas: Authentic Recipes for Mexican Ice Pops, Shaved Ice & Aguas Frescas. It is full of delicious, cold and refreshing treats that are made with real fruit, and unexpected ingredients. 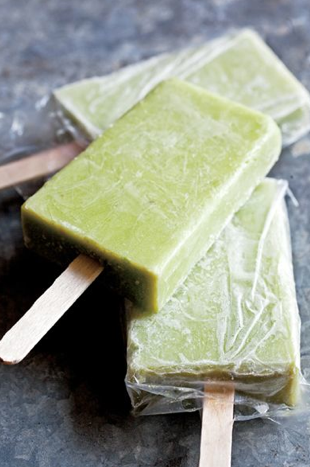 With the cupcake craze slowing down, we predict that paletas will be the next big thing! We chose this recipe from Gerson’s cookbook because we love the idea of using avocados. They are delicious, healthy, and not given enough credit as having a starring role in sweet dishes. In a small saucepan, cook water and sugar over medium heat. Keep stirring until it comes to a boil and the sugar is completely dissolved. Let the mixture cool until it is room temperature. Next, cut each avocado in half, lengthwise. Remove the pits and scoop the flesh out of the peels. In a blender, blend the avocado flesh, cooled sugar syrup and salt, until it smooth. Scrape down the sides if needed. Next, add the lime juice and blend again, until combined. Pour the mixture equally among the molds, secure the lids and freeze for approximately 5 hours, or until solid. Freeze until the paletas are starting to set, 1 1/2 – 2 hours, and then insert the popsicle sticks. Freeze again until solid – approximately another 4-5 hours. Follow the instructions that came with your machine. For a fun way to serve them up to a crowd, freeze orange slices and then place the paletas on a plater filled with ice and frozen orange slices. To store them once pulled out of their molds, wrap them in wax paper.